Sorry Folks but I'm no longer selling water wheels. I'll leave the site up for a while so you can get ideas since it's paid for for a while. Now offering all Steel Water Wheels. Click Here. Water wheel plans are here. To the left is a 7' Flared Spoke water wheel on a single side mount that the customer mounted beautifully. 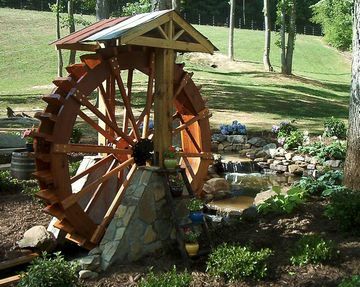 All of my water wheels look great but like the correct frame for a painting how you mount your water wheel can really add impact to your water feature. Pick a size (up to 12' tall) and I'll build it for you. These are Rustic Style water wheels with adjustable hubs, black bolt construction, and a fish safe finish that never needs to be reapplied. The larger 12' wheel has the optional "child guards" making it almost impossible for a kid to jump into the moving wheel and going for jog like a hampster in a wheel. It will be shipped to Texas. The 3 1/2' wheel is going to Montanna for electrical production. Both wheels are on temporary stands with "build" axles and bearings. All of my water wheels ship with new axles and bearings. To the left are some of my Flared Spoke style water wheels. 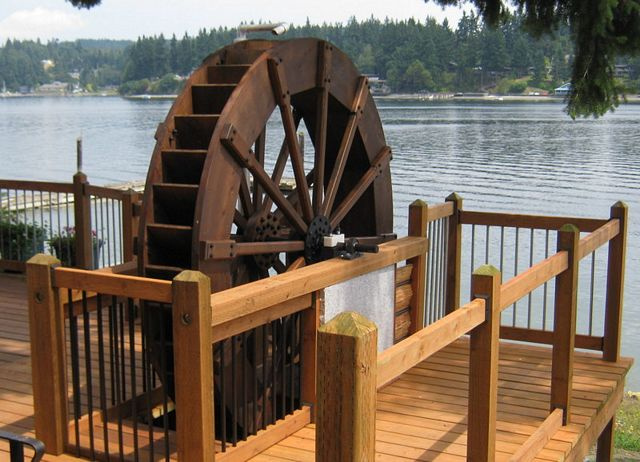 Flared Spoke style waterwheels have a much more polished look with beautiful Red and Inland Cedar with flared spokes. The flared spokes and paddles are routered like a fine table and the finish reflects the light. 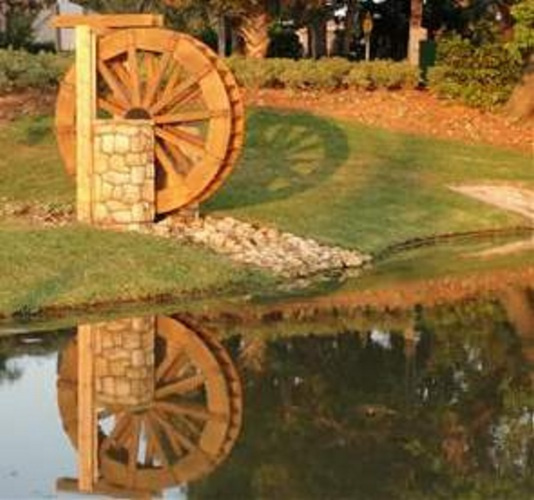 These water wheels look great with some colored lighting in your water feature catching the moving wood and water drops in the evening as your water wheel spins. The larger water wheel is 6 feet tall with 12 spokes per side for a fuller look and shipped to Nevada. 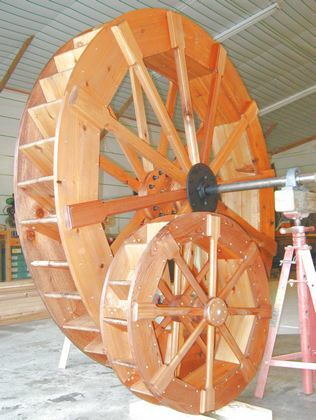 The smaller water wheel has all wood hubs and is only 30 inches tall,,, darn if I can remember where it shipped to. To the right is an 8' Rustic style water wheel using a single side mount. The customer is proudly feeding his water wheel in the North Georgia hills. He later added a wood flume to feed his water wheel. Notice how on larger water wheels I add more spokes to give the water wheel a fuller look. Above is a very wide Inner Spoke style water wheel on a curved stand. and yes, I can make your water wheel wider like this water wheel I shipped to Utah. The customer covers it with lights every Christmas. I don't guarantee that my water wheels remain watertight over the years but I put a lot of work (and some fancy wood joinery) to try to keep the outside wood dry so your wheel stays looking great for years. 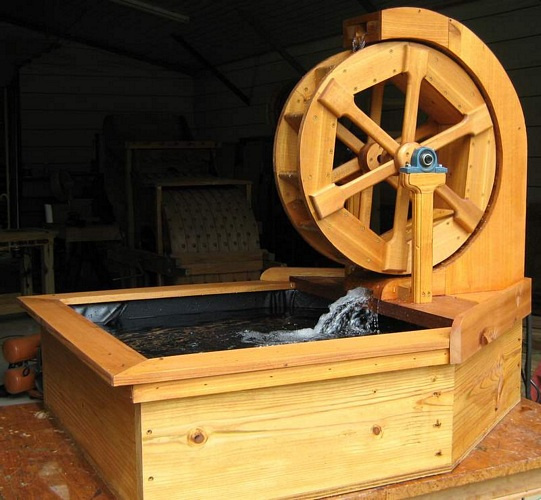 I've built over 400 water wheels so unlike the guys who build water wheels occasionally in their garage I know through experience what works and what doesn't. The 8 foot Flared Spoke style water wheel to the left is being pushed by the water flowing under it in the stream. It is a popular place for weddings and has been featured in many newspapers over the years. The customer had orginally ordered a smaller water wheel but after seeing it decided he wanted a larger wheel to make a statement for this Georgia retreat. Below is a 6 foot water wheel I built for the Franklin Institute of Technology in Philadelphia. Next to it is a little 2 foot water wheel mounted in a water box with a curved stand. Water flows both over the wheel and beneath the wheel making a little waterfall for more water splashing sound. A video of one of these wheels running can be seen here. Larger water wheels are not a problem. Generally when building a wheel for a historic site like this one in Medfield Mass I recomend a hybrid style water wheel which became the water wheel type of choice in N. America around 1850 as steel became more available. Unlike the older Compass style water wheels with their wood axles and small steel grunions the hybrid style water wheels require much less maintence and use a historically accurate paddle design. Rustic style wheels with their black bolt construction are finished with a fish safe process that slowly gives the wheel an aged look; the same look as if the wheel had been outside for five years but the process only takes about six weeks to make the wood darken the same as if it had been out in the sun and rain for many years adding to the rustic appearence. And yes, all of the finishes I use on my water wheels are fish safe. I get that question a lot. Larger water wheels can also be used for excercising your kids like a hampster.